Endorsed by Edexcel, this series supports the structure, content and assessment requirements of the Edexcel GCSE in Religious Studies specification A, Units 3 and 10. These resources clearly and concisely explain what your students are expected to understand about each topic in the specification. Fully addresses the requirements of the specification in an easy way for your students to understand. Include student-focused features to aid learning such as key terms and summary boxes. The zoomable, flickable searchable pages are perfect for whole class teaching, while 24/7 online access gives students the freedom to study anytime, anywhere. 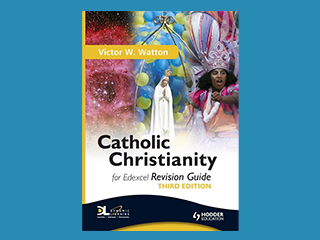 Catholic Christianity for Edexcel eTextbooks fully address the requirements of the specification in an easy way for your student to understand. Aims to raise students’ achievement with quizzes, interactive exam questions, PowerPoint presentations and video clips of a Catholic and an Anglican expressing their views of different issues. Catholic Christianity Dynamic Learning enhanhances students’ learning. Help your students to succeed with this revision guide which provides the content they need and guidance on applying it. Catholic Christianity Revision Guide Includes a full summary of the course content and expert advice. It includes lesson plans and worksheets for each topic in the Student’s Book, starters and plenaries for every lessons, end of section assessments, and mark schemes.